No parent wants to see their child get injured while playing sports but may wonder what they can do to keep the kids safe. While there are a number of ways to reduce the chance of a sports related injury, providing kids with high quality safety gear may be the easiest and most important. Kids will be kids and as such, they don’t always agree with their parents about rules. While parents may be able to give their children a little leeway about some things, matters of safety need to be nonnegotiable. From the time that kids step into their very first pair of roller skates or sit on the seat of their new bicycle, they need to be taught that using safety gear is mandatory. A generation ago, only kids participating in team sports typically used protective equipment, but today’s parents are more safety conscious than their parents were and this new awareness of safety issues has extended far beyond the realm of organised sports. A&E doctors will attest to the benefits of sports safety gear, especially helmets. Something as simple as a fall from a bicycle can have devastating consequences for kids who are not equipped with bike helmets, so even if kids object, parents need to insist that kids keep safety in mind while they are having fun and getting fit. When we hear the word ‘plastic,’ many of us think of small containers designed to hold leftovers in the fridge, but new plastics can be credited with protecting athletes from injuries and even saving their lives. Polycarbonate is a type of plastic utilised in protective goggles, as well as some shin, knee, elbow, wrist and face guards. Standards for safety gear continue to get stricter and the ever-improving developments in the use of plastics means that for kids in sports, plastics can serve in more important ways than merely keeping roast beef from drying out. The types of safety gear that kids need to protect them while playing depends on the specific activities that they are engaged in. Safety equipment should be chosen carefully to meet the requirements of each sport and parents need to realise that helmets and other gear is usually not recommended for use in more than one sport. For example, bicycle helmets are not the same as those used by baseball players while they are up at bat. Safety equipment is only effective when it is used for its intended purpose, is kept in good condition, and is sized properly for the child. Kids learn by example, so parents need to wear appropriate safety gear themselves. For instance, all family members should be equipped with bike helmets and should use them every time that they ride, even for short jaunts (bicycle helmets are said to reduce head injuries by 85%!). Kids are more likely to use their safety equipment if they are pleased wit the way that it looks. When possible, kids should be allowed to choose things like helmets themselves, selecting one in a color or pattern that they find attractive. 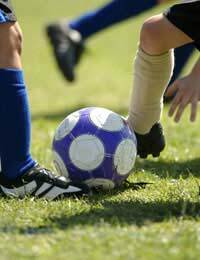 Remind kids that face masks, eye protection, shin guards, and other safety equipment needs to be used for more than just games. Statistics show that over 60% of sports related injuries occur during practices. Kids who require the use of prescription eyeglasses may need prescription safety goggles made from shatterproof polycarbonate plastic. Regular specs are not designed to withstand the blunt force that they may be subjected to during active play. There is no question that participation in sports can put kids at a certain level of risk for injury. While parents may naturally worry about their children’s safety, they can take comfort in knowing that most sports related injuries are mild and have no lasting effects on children’s long term health. By offering their kids the protection of high quality and well-fitting safety equipment, parents can be comfortable sending their children out to play. After all, the risks of injury while playing sports are relatively small, but the dangers associated with inactivity are certain.